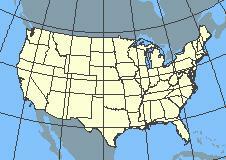 This, as we assume you know, is a map of the continental United States. Owlcroft is in Washington State, the State at the extreme upper left of the map, bordered by the Pacific Ocean to the west and Canada to the north. Owlcroft lies in Adams County, Washington, near the City (pop. 1,750) of Ritzville. Click on to learn more about that location and its weather. Besides Owlcroft House, the property has on it the remains of an older farm household, abandoned probably about a half century ago. We chose to leave the old buildings in place as adding atmosphere and reminding us and visitors of the pioneering days out here on the plains of the Columbia Basin. And now, let's get on to describing--and showing--Owlcroft House and its immediate environs.